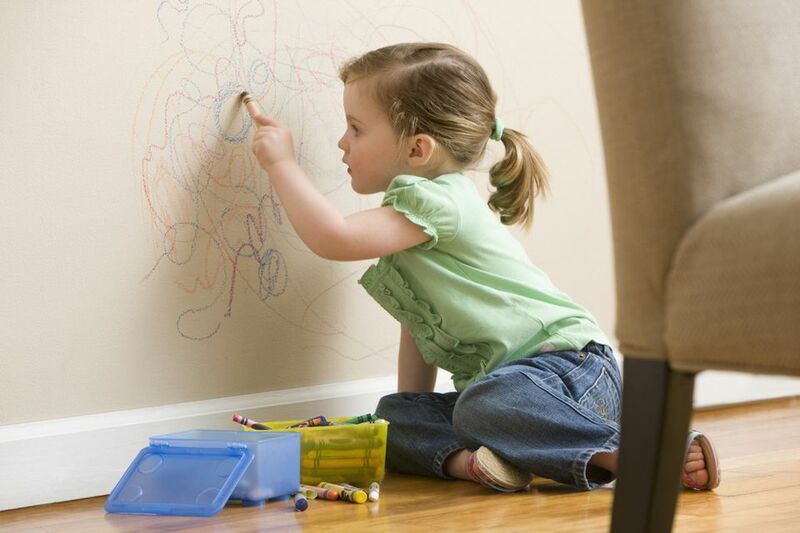 Crayon on the walls — it's an unfortunate rite of parenting passage, but the cleanup needn't add to the punishment. For a cheap and effective way to remove those offending crayon marks, turn to common household items and watch them vanish before your eyes. In particular, let vinegar, that amazing all-purpose cleaner, do its trick. To clean crayon from your walls, dip an old toothbrush in undiluted white vinegar and use it to scrub away the stain. Once you remove all the offending crayon, wipe the wall with a clean, damp cloth. If you're concerned about the smell of vinegar, don't worry: Once the vinegar dries, the smell disappears, and it leaves no lingering odor. Vinegar is a useful cleaner for many household chores. It is a perfect choice for this task because it is inexpensive, nontoxic and safe for most surfaces. Test vinegar on a small area before applying it to the entire stain. Not all paints and finishes will react favorably to the treatment, and you might have better luck with one of the options explained below. As with any cleaner, avoid all contact with your eyes and prolonged contact with your skin. Vinegar may not be the best option for every wall surface. If you find that your vinegar test was not a success, give one of these tricks a try. Regular (non-gel) toothpaste is a tool that countless parents have used to remove their child's art from walls, and it has even successfully removed messes left by permanent markers. Toothpaste can help you ensure that those marks will not be permanent — not on your watch anyway. Simply scrub the toothpaste in with an old toothbrush or rag and rinse with water. Baking soda is a mild abrasive that can be effective as well. Dip a damp rag into baking soda, gently scrub it in and rinse with a second damp cloth. Sometimes the most obvious answer works: A pencil eraser may do the trick for small marks. Be very gentle as you don't want to rub off the paint, and use an even lighter touch on wallpaper. If a regular eraser does not work, an artist's gum eraser may do the trick. The solution to your crayon problem may be right in your fridge or bathroom. Parents have used mayonnaise, peanut butter, shaving cream, and even hand lotion to remove crayons from paint. Try rubbing your "remover" of choice into the crayon and allow it to set for several minutes. Then just wipe it away with a damp cloth.